"Jane Quick of (Manorvydden?) co. Cornwall widow of John Quick of Newton St. Cyres co. [...] Devon Rev. Nutcombe Quick, chancellor of the collegiate church of Exeter, and Andrew Quick of (Alnethy?) co. Cornwall esq. to Hugh, Lord Clifford of Chudleigh and Marmaduke Tunstall of Wycliffe property: manor of Hightley with Shipperidge Mills, 4 houses, 2 cottages; mansion house, barton and farm of Lawell, ruined house called Mount Pleasant and named closes in [...] pers. Hennock and Chudleigh." Shipperidge Mills could be a corruption of Shepherd's Mill (later Bridge Mill?) The name Sheperidge Mill occurs in the deed of 29 April 1597. It seems then at some point Sheperidge Mills might have become (Chudleigh) Bridge Mill; it is downstream from Palace Mill and was located next to Heightley Bridge, close to where the Kate Brook originally joined the Teign. Heightley Bridge was demolished in the late 1960s and replaced by a modern concrete structure. It is strange that the mill was called Chudleigh Bridge Mill when in fact it was located much nearer to Heightley Bridge. 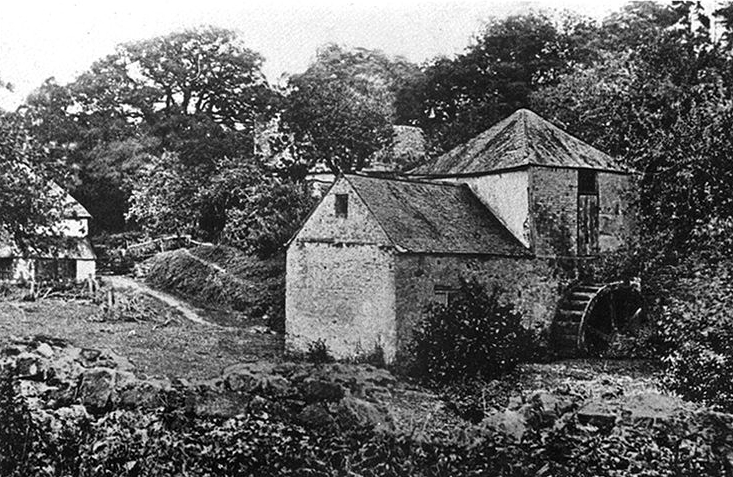 The mill photographed in about 1890. In 1701 there was a mill called Lawell Tucking Mill and there seems to have been a second, more recent one, a grist mill, fifty-eight years later. The White and Metherell families later operated the grist (corn) mill as such until its closure about 1890. The building then continued for agricultural purposes, with the White family farming and running a dairy business. The mill seems to have been demolished in the 1930s. More recently the mill house was named Wisteria Cottage and in the late 1960s in the occupation of Mr and Mrs Sidney Ernest Youdle. They had run a smallholding there from at least 1939. The Electoral Rolls for 1835/38 has Mark Burnell of Kingskerswell for Chudleigh Bridge Mills leasing 'house and lands'. 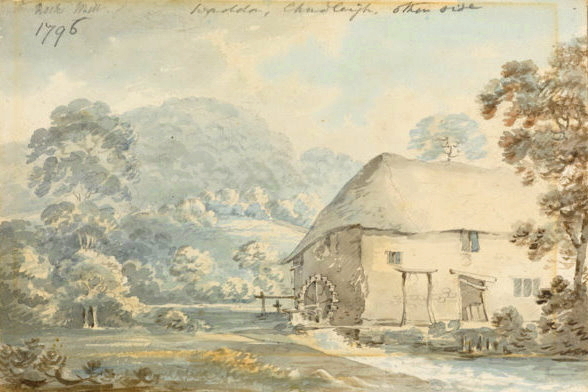 The 1838 Tithe Listing does not mention the mill but the cottage, owned by Lord Clifford was in the occupation of Joseph Wills. There is no specific entry for the mill on the 1841 census; even if it was unoccupied the name should have been listed so it seems to suggest by its absence that it did not exist then as a mill. There is one entry in the return for 1841 as 'Chudleigh Bridge' this being in the occupation of agricultural labourer Joseph Wills (60) and his wife Betsy also stated as aged 60. This was the cottage as mentioned above. The Exeter Flying Post of 3 October 1844 carried a To Let notice for Chudleigh Bridge Mills. The description stated that there was a never failing stream of water driving three pairs of stones by two water wheels, bolting (sifting) mills etc. with two acres of meadow, orchard etc. Apply to John Whiteway, Town Mills. 1856–1857 William White. A butcher in Fore Street in 1861 aged 31 then to Palace Farm by 1866, in 1901 (73) and still there 1906. (His sons were still at Palace Farm in 1939). 1857–1872 Samuel White, he was then replaced by Metherell but continued there as a farmer. At the time of this census Samuel's son, Samuel (38) was living at the adjacent Lower Heightley, he was also a miller at that time. 1870–1900 Mrs Mary Frances McDougall (nee White), later at New Exeter Street-flour and meal factor, but had returned by 1891, her son William had died in 1880 aged 26, he was buried in the churchyard where a gravestone still exists. 1891 Miss Amelia Maria Louisa White (53) dairy woman born at East Ogwell with her widowed sister Mary Frances McDougall (56) also originally of East Ogwell. 1901 Miss Amelia White (62) – dairy woman with her widowed sister Mrs MacDougall (64) also a dairy woman. A second household was also listed at the mills headed by Mark Reed (52) described as a steam sawyer. The adjacent mill cottage was unoccupied. The leat supplying the mill branched off the Kate Brook at a small weir (just upstream of where the public footbridge crosses over the Lawell pathfield) and has been filled in apart from a section that runs parallel to the Lawell House driveway for a short distance. Near the lane the leat was joined by a short section from Kate Brook near Lower Heightley. The mill itself was a little way away the other side of the lane (to Shepherd's Hill) and from the mill cottage. The mill building was demolished sometime in the period 1920-1935. The cottage remained until the late 1960s. When the C16 mill cottage (then called Wisteria Cottage) was to be demolished the road contractor Messrs Cubitt had their attention drawn to the fact that there was a plaster cast above one of the overmantels that needed saving. The cast was saved and now hangs in the Town Hall Council Chamber. It carries the date 1661 and depicts a man alongside a large fish that appears to be holding the man's severed right arm in its mouth. There was a second cast set into one of the bedroom walls depicting a boy fishing but this was not saved. Mr and Mrs Sidney Ernest Youdle had been living in the old mill cottage since about 1938, by then called Wisteria Cottage. They ran a smallholding there and it is recalled that the passageway leading into the cottage was paved with slate headstones – being on the floodplain the cottage was prone to flooding. In early 1939 GWR approached the parish council for permission to run a water supply pipe from the cottage main to supply their nearby camping coach at the station siding, but this was refused. The Youdle's remained at the cottage until it was earmarked for demolition in the late 1960s. Lawell Lodge across the lane was built in the period c1920–1936. 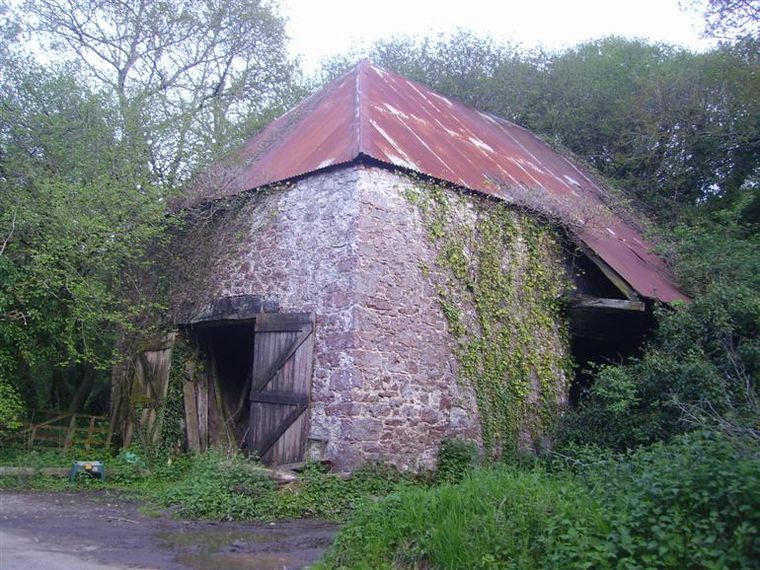 Farley Mill, or Homestead, opposite Crockham Quarry on the Teign was a corn mill. The occupier according to the 1823 directory was John Floud (described as a maltster). He is similarly described in the 1830 directory. The 1838 Tithe Apportionment shows the mill to be in the ownership of Sir Lawrence Palk of Haldon House. The occupier was John Floud with the associated estate extending to 9 acres 3 roods 19 poles. Although the 1837 Electoral Roll has Thomas Eales as occupier. From at least the early 1950s the mill house has been used as residential accommodation. The original end section of the mill leat leading into the nearby River Teign – today no more than a shallow ditch – can still be seen just beyond the building alongside the lane. The 1994 Voter List has Alfred E and Doris E Davis. The hamlet of Harcombe lies no more than 2 miles from the centre of Chudleigh and forms the north-east corner of the parish having its north-eastern boundary with both Kenn and Kenton parishes. The source of the Kate Brook stream is to be found just outside the parish (in Kenn Parish) and the stream flows through Harcombe (north-east to south-west) on its way past the town of Chudleigh to its confluence with the River Teign at Chudleigh Bridge. This stream (or a smaller stream running in to it) would have provided the power to work the mill at Harcombe. Little is known of the mill itself but there are records (Devon Heritage Centre) showing that in the C18 it was in use as a fulling mill and so involved in the production of cloth. 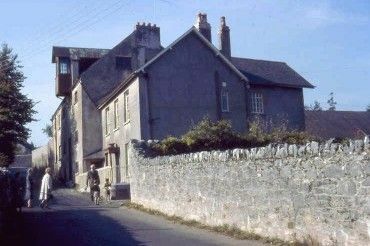 The Chudleigh Overseers Accounts show that the mill was 'in ruins' by the year 1814 which is generally the time accepted that cloth production was dying out. We cannot pinpoint the mill location for certain but the Tithe Map/Apportionment drawn up in 1838 shows a plot to the south of the Kate Brook and just below Lower Harcombe named as 'Pound House Orchard'. A pound house was used for cider making and these buildings were often associated with mills. The Harcombe estate was anciently in the hands of the Balle family and following the death of the last of the line (1749) the estate came by marriage to Wilmot Vaughan (1st Earl of Lisburne) who lived nearby at Mamhead House (the former Balle seat). The 3rd Earl of Lisburne (John Vaughan) disposed of Mamhead House and the Harcombe estate to Sir Robert William Newman in 1823 who is shown in the 1838 Chudleigh Tithe Apportionment as the owner of Pound House Orchard. Yeoman James Cox was the occupier. As for the mill we know from the parish Basic Rate List of 1811 that the premises were still in the ownership of the 3rd Earl of Lisburne but had been disposed of within a couple of years as by 1815 the Listing then detailed the mill as 'in the ownership and occupation of' John Hore, a thatcher. Palace Mill adjacent to the Kate Brook stands a little downstream from Parkway Mill. It has been suggested as the mill that potentially ground the Bishop's corn being as it is in close proximity to the Bishop's Palace. The mill building that exists today is of recent date, following a devastating fire in 1877. There is a photograph of the former mill building but this too was likely a building of a fairly recent date. At least from the early 1830s this has been the location of a grist mill that produced flour continuously under a number of proprietors until about 1906, the last miller being Mr Daniel Hookway. Originally a corn mill it is possible, as with other mills in the parish, that at the height of the woollen trade the mill contained machinery for that purpose and was converted to grain again when the wool trade died out. The 1838 Tithe Apportionment listing shows the mill to be in the ownership of Lord Clifford with John Wotton the occupier. Listed together with Beer Parks the land extended to 24 acres 1 rood 32 poles. This John Wotton had been the proprietor of Town Mills until about 1793 when that mill was then taken on by his step-father John Whiteway. The 1841 census lists four of the Wotton name in the area of Palace Mill although it is not named as such. There was John Wotton (69) miller, William (30), Walter (30) and Daniel (20). The ages are not necessarily accurate and in that census were usually 'rounded up'. There was likely another son called John Wotton, he was at Buley's Mill (Parkway Mill) at the 1838 Tithe Apportionment date. Walter Wotton later ran Parkway Mill (by 1856) then the Ship Inn for a number of years, he died in 1902. His brother William followed him at Parkway Mill until the early 1860s. During the occupation of Robert Hall a devastating fire occurred that reduced the mill buildings to a mere shell. The Exeter Flying Post reported this calamitous event on 14 March 1877 and said that the extensive mill and machinery, adjacent house and granaries belonging to Lord Clifford and occupied by Mr Robert Hall was totally destroyed despite the efforts of the Chudleigh fire engine. The fire broke out at 3am and at the time a strong gale was gusting which was blamed for the ferocity of the flames. Two thousand bushels of wheat were lost and not insured to their full value. The fire prompted calls for a second fire engine for the town but nothing further was done. The mill was rebuilt with Robert Hall remaining as miller for a further six years. 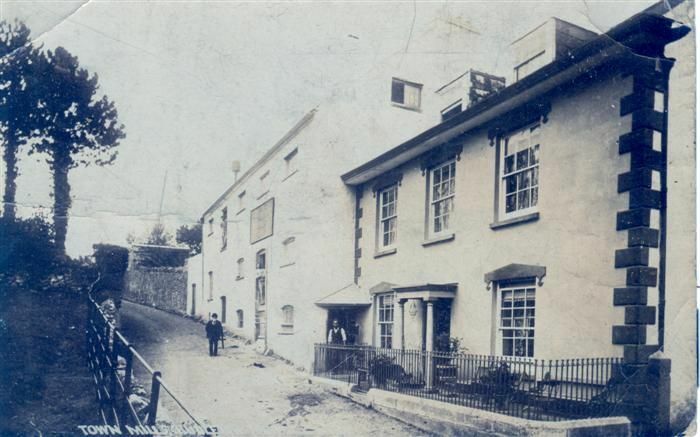 A melancholy event was recorded in the Mid-Devon Advertiser on 20 March 1897 – John Metherell, aged 27, a miller with his father at Palace Mill suffered a heart attack at the Clifford Arms Hotel and died shortly afterward. 1857 D Wotton (likely Daniel). It should be noted that the Wotton family were also concurrently at Parkway Mill. 1861 Robert Hall until at least 1888, he then spent about two years at Parkway Mill then moving to Lower Mill, Kingsteignton, where he was assisted by a son, Robert Hall. His elder son, John Maddicott Hall took over Parkway Mill 1890–1905. In the Mid Devon Advertiser of 16 September 1899 the bankruptcy of William Henry Hookway and Walter George Hookway trading as W & W Hookway Millers was announced with debts amounting to £427 13s. They had taken over from their father about twelve months before and attributed their debts to settling his liabilities, paying interest to money lenders, the fall of the price of corn and the rise in the wheat price due to the American War. The 1901 census confirms Daniel Hookway as the miller and farmer, with him his wife Harriet and two sons, William (28) farmer and Walter (23) farmer. Daniel and Harriet were originally of Sandford near Crediton, their sons both born in Winchester, Hants. By 1919 the building had been acquired by Mr John Hellier, previously of Harcombe Barton and the father of Frank and Artie, the latter taking on the mill on the death of his father in 1929. Artie married Miss Irene (Rene) Martin in 1929 and in addition to the mill farm they ran 11 Fore Street as a dairy from about 1935 until the mid-1940s when both the mill farm and 11 Fore Street were disposed of. They then moved to live at Lawn Farm in Parkway Road (later renamed as Harwood House). The Sampson family took over the tenancy of Palace Mill Farm on the departure of the Hellier family. At that point it consisted of seventy acres that accommodated a small dairy herd and a fifty-head flock of sheep. There was also a small amount of corn farming and one acre always set aside for potato growing. William Sampson took over the farm on the death of his father and purchased it soon afterward along with six acres of adjoining land. At about the same time he purchased sixty acres of farmland at Harcombe and later the farmhouse there which he renamed Harcombe Barton. He continued to run Palace Mill Farm until its sale in 1988. On sale the mill farmhouse of three-bedrooms was sold with planning permission for conversion to four self-contained apartments. In the end only three dwellings were built. The mill wheel was served by a leat that flowed from a weir just south of Parkway Mill and which ran little north of the Kate Brook for its whole length. Leaving the vicinity of Parkway Mill it passed under a footbridge (the path of which leading up to Target Wood) and then skirted grounds belonging to The Laurels. Palace Mill is a little unusual in that the leat passed under the middle of the mill with the overshot water wheel being located inside the building. Where the leat exited out under the south wall a closed up arch can still be seen. The leat continued to run parallel with the Kate Brook for some yards and rejoined it near to Glen Cottage. In the mid-1960s severe weather washed out the bed of the Kate Brook leaving the leat at a much higher level and this heralded the demise of water power to the mill wheel. The wheel and associated machinery remained in-situ until the building was put up for sale in 1988. Palace Mill photographed in February 2010. Parkway Mill has been known by a number of names down through the years. The first record we have of Park Mills is reference to a deed of sale where Andrew Cholwich purchased, on 25 March 1650, Mills Park, described as a close of land adjacent to the three mills called Park Mills. The vendor was John Soper, a tanner of Chudleigh. Another of these former names was Oil Park Flour Mill. Oil Park was the name of the adjacent seven acre pasture field that lay between Millway and Kate Brook. The origin of this name is unclear. It has been suggested that it was a corruption of holy path, i.e. the way to the church. The origin of the name might have something to do with the process of extraction of lanolin from wool by washing and scouring. Today wool for guernseys has the lanolin left in and is called oiled wool. The explanation that finds most favour is that it was a corruption of holly park. On the 1838 Tithe Apportionment the field is unnamed but belonging to the 'Poor of Ashburton', it then totalled 6 acres 3 roods 18 poles and was in the occupation of John Meadway. In 1783 the field (then called Park Field) was purchased by the Ashburton Overseers out of a bequest of £370 left to Ashburton parish by a John Bickham. Oil Park was discussed by the council in 1902 when street lamps were considered between there and Parkway (presumably the lane from Parkway Mill up past Hurst House). In 1919 the field was considered for allotments but rejected as not suitable. In 1921 Oil Park was sold and described as a portion of Bickham's Charity, Ashburton. It was purchased by Mr W Whiteway of Town Mills for £1099. Various outbuildings were included in the sale that could well have been the redundant Parkway Mill buildings, within seven years in use again by the Chudleigh Light and Power Company. Oil Park field remained as arable and was only used for housing as recently as the 1980s when a development subsequently named Lawn Drive was built on it. The mill was converted from flour to wool spinning in the late 1700s by Messrs Bailey and Leare. They installed machinery to spin wool for worsted cloth; probably with spinning-jennys or the later improved spinning-mules. This was a radical departure from the practice of cottagers spinning at home. When the jenny was first introduced to the south-west, at Shepton Mallet, Somerset in 1776, there were riots and a petition to parliament. 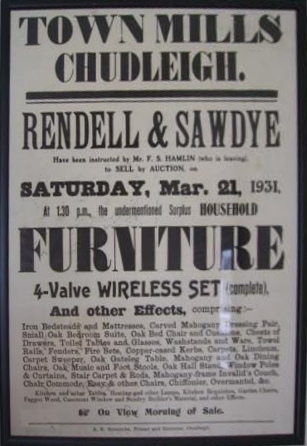 There are no records of disturbances in Chudleigh over these innovations, but the venture did not last for long. Spinning was abandoned in 1830 at the mill by Mr Pearce of Exeter who had been tenant of the mill for about ten years by that date. Mr Pearce had followed a Mr Bampford of a highly respected Somerset firm, although he had carried on extensive business at the mill Mary Jones says it was far from lucrative and relinquished at his death (c1823). 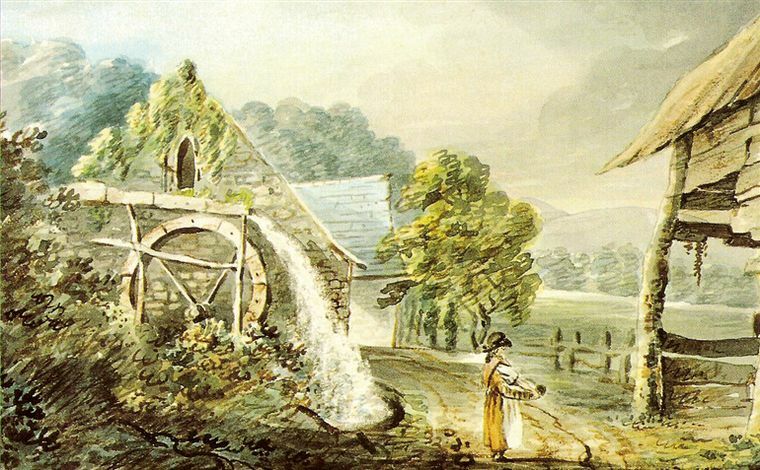 1797 William Bailey 'White's Mills'. William Bailey continues as the proprietor of the mill until 1836 and presumably lived there with his wife. 1812–1823 Samuel Paul Bamford. During his time the mills were variously described as 'Mills, late White's and Factory', 'Mills, now a Factory', 'Worstead Factory' and 'Mills'. 1825–1826 Pearce is occupier, described as 'Factory'. In the 1832/36 Electoral Rolls William Bailey holds freehold tenement, 'Park Mills'. To be sold at auction, on the premises, on Thursday, the eighteenth of September, at one o'clock by Mr Robert Taylor, FOUR WORSTED SPINNING FRAMES, of ninety-six spindles each, with PREPARERS equal thereto, the whole of which is of the best principle and in good condition. Also, many gross of Drawing, Slobbing, Roving and Spinning BOBBINS, Seven Pair Warping Bars, Skainers, and other articles necessary for the manufacture of Worsted, &c. &c.
William Bailey was buried in the churchyard. He died in 1837 and was the husband of Emma Bailey. She was living at Coburg Cottage in 1841, lodging at the Plymouth Inn in 1851 and in Exeter Street in 1861, she died in 1862. The 1838 Tithe Map shows the mill as Hemen's Mill and owned/occupied by John Wotton, he was also operating Palace Mill and had before 1793 been the proprietor of Town Mills. The land comprised 1 acre 0 roods 7 poles. The 1841 census does not name a mill between Palace Mill (at which were John Wotton and family) and Mill Lane but there are two properties listed named 'Factory' and 'Factory House'. The occupiers were labourers named Samuel (50) and James (25) Causely. This name was an alternative to that of Parkway Mill as borne out by an EFP sale notice of January 1860 (below). The 1850 directory lists a William Wotton as a corn miller but does not state the location but from later evidence he would seem to have been here at Parkway Mill. His family were operating and living at Palace Mill at the time and it may be that there was no living accommodation available at Parkway Mill at the time. The 1851 census named the mill as Buley's Mill, no millers were in occupation at the time. There were however two households, one headed by Joseph Edwards an agricultural labourer, the other Samuel Haydon a sculptor. On 18 January 1860 the Exeter Flying Post carried a For Sale notice for the freehold corn and flour mills known as Factory Mill otherwise Parkway Mill. Described as: '...all those old-established and well-known water grist millssituated within a quarter of a mile of Chudleigh, together with outbuildings, cottage and about half an acre of orchard.' The mills were stated as 'supplied by an unfailing stream of water driving two pairs of stones, are well fitted with complete machinery and mill gear all in good repair and working condition.' Application to view was to Mr William Wotton on the premises. The auction was to take place at the Clifford Arms on Monday 23 January 1860 at 3 o'clock in the afternoon. On census day 1861 (April) William Wotton (aged 58) was still in occupation, did this indicate the mill had not sold the year before? He had moved away by 1866. In 1866 Richard White had replaced William Wotton, the Exeter Flying Post of 13 June that year advertised a sale at the mill of various effects belonging to Mr Richard White. 1901 John Maddicott Hall (aged 42) described in the census as farmer and dairykeeper. 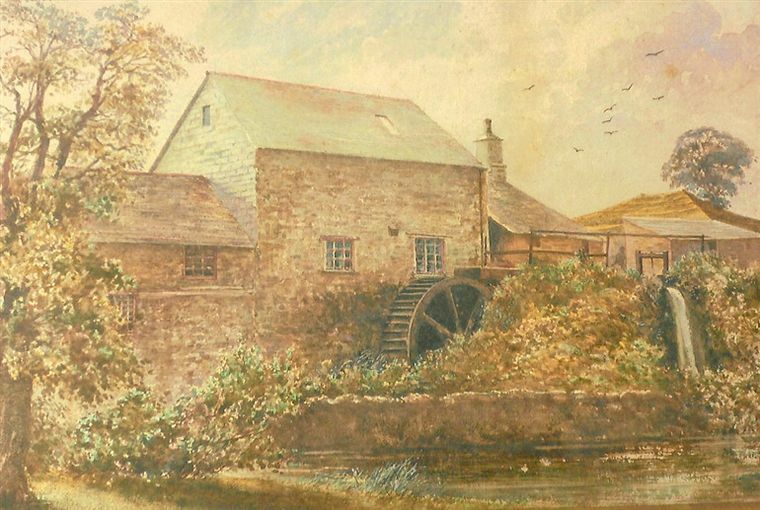 The mill painted in 1900. The original owned by Mandy Stevens and copy used here with her permission. In the December of 1895 the results of the Chudleigh Parish Council elections were published in the local newspaper. J.M. Hall (Conservative) described as a miller received 157 votes. John M Hall appeared in the 1906 directory as running a dairy at Parkway Mill but was no longer listed by the time of the 1910 directory. In fact he was to cease trading by August 1907. On 25 May 1901 The Mid-Devon Advertiser reported that Rendell & Symons were to hold an auction at the Clifford Arms to sell the freehold residence, cottage and mills known as Parkway Mills. Bidding started at £500 and extended to £700 but failed to reach the reserve and the lot was withdrawn from sale. On 9 August 1907 the Weekly Express advertised that numerous farm and dairy machinery was to be auctioned due to 'giving up business' that sale took place on 19 August, the house and mill machinery was to be auctioned at the Clifford Arms on 30 August but was withdrawn and subsequently purchased privately by Mr William Henry Shapley, builder. At the 1911 census date, aged 52 John Maddicott Hall was listed in Sherborne, Dorset. The Mid-Devon Advertiser carried a small item on 25 January 1908 when it was reported that a Mr. Drayton of Parkway Mill injured his leg in an accident with an axe. He was presumably a tenant of William Shapley. From 1929 to 1947 the mill premises housed the generating equipment for the Chudleigh Electric Light and Power Co. From contemporary town directories we can see that the mill house (then listed simply as Parkway) was in the occupation of a Mrs Keane from 1919 to 1930. She was followed by Major Basil F. Kindersley JFC and his wife from about 1933/34. He participated in the 1934 Beating of the Bounds on horseback and started up Parkway Riding School. By the early 1950s the mill house was a hotel under proprietor Mr W. Thompson. The swimming pool (fed by Kate Brook) was the scene of a tragic accident in May 1953 when thirteen year old Anthony Frederick Coram dived in and struck his head on the bottom of the pool. Taken to the Princess Elizabeth Hospital, Exeter he died there in the October. The pool was located on the water wheel side of the mill buildings and has long since been filled in. It now serves as a lawn for the property called The Granary. Mr Thompson was still living at Parkway in 1957, at that time voicing his concerns regarding the adjacent Parkway Double Bridges and how they presented a dangerous situation for young children, particularly as there was a twelve foot drop to the brook from the Kate Brook footbridge. The newspapers of 1955 and 1957 also mention motoring offences of a Ernest William Baker of Parkway Mill, he was probably living in a self-contained part of the mill created when the hotel was first established. The 1994 Voter List described the various dwellings at Parkway Mill as Parkway Mill House, Cellar Flat, Hurlock Cottage (Flats 1 & 2), Brook Cottage (Flats 1 & 2), The Cottage, The Granary and The Granary Flat. Hurlock Cottage was converted from the stable block as used by Mr Thompson's riding stable. Today the mill house continues as a residence and at the pedestrian entrance is a tablet which records that Prof. Paul Kline (1937–1999) lived there 1966–1978. The mill leat that ran from Kately Bridge at Bridgelands to the mill can still be seen in places when walking along the Lawn Drive east side pavement. The wheel, of overshot type was located on the north-east outer wall of the mill as can be seen in the image above. Close to where the leat flowed back into Kate Brook was a weir from which another leat branched off which fed the wheel downstream at Palace Mill. The principal mill of the parish from earliest times was likely to have been Town Mills, located at the bottom of Clifford Street (previously Mill Lane) and close to Kately (otherwise Bridgelands) bridge over the Kate Brook. Always referred to as Town Mills rather than Town Mill this suggests existence of more than one mill wheel and we know from sale particulars of 1792 that there were in fact three wheels existing at that time. It was usual that one wheel would drive one pair of mill stones and often the wheels were in separate buildings but sharing the same leat. The name Town Mills appears in many locations throughout the UK and was used literally to identify the mill that belonged to the town. Chudleigh was described as a new town in the Register of Bishop Walter Stapledon in 1309 when the fulling mill paid 20s per annum to the bishop as the lord of the manor. We cannot say whether this fulling mill was Town Mills as records of the period are scant. Chudleigh had belonged to the See of Exeter from a very early date (at least the year 1080) and we can surmise a mill existed here from that distant time. We do know that Town Mills was a fulling mill at one point as we know that the fields at either side of the Kate Brook were the washing and tucking fields. The water wheel(s) in those times would have driven one or two large hammers, with heads larger than a man. These pounded wool or cloth in a great trough filled with fuller's earth solution or urine, and a curve on the hammer head would turn the cloth with each up stroke. After this process the cloth would be stretched on the tenterhooks in the tucking fields to be sheared, perched and dried. What is uncertain is whether Town Mills was also a gig mill for knapping and finishing the cloth. This would have involved passing the cloth over a revolving drum fitted with teasels, or later with fine wire spikes. There appears to be no direct evidence of gig mills in Chudleigh and it may be that all finishing was completed in Exeter. There is surviving evidence of a second wheel at Town Mills but it is not clear today what its purpose was. By the year 1547 the then Bishop of Exeter, John Veysey was more or less forced to sell all the church property which included the Manor of Chudleigh. Passing to the influential Bridges family of Oxfordshire the ownership of Town Mills lay with them until 1597. In that year they sold off much Chudleigh property to those living locally and it was that Town Mills and other property passed to James Eastchurch of Lawell. The Eastchurch family remained prominent in Chudleigh until their disappearance by the early 1700s by which time the majority of the manorial property had passed from them to the Clifford family. However it appears that the freehold of Town Mills had earlier passed to the Ewens family who also had long associations with the town. There is no formal evidence of a transfer but there are documents concerning other property that link these two families. Moving forwards surviving records become more complete and as for early millers we know of Nicholas Ewens as shown in the Devon Freeholder Lists for both 1711 and 1717. He was buried here in 1721. The next list for 1733 details Thomas Ewens Snr who died in 1736. The following two lists for 1751 and 1762 have Thomas Ewens who died in 1764 and possibly the son of the earlier mentioned Thomas. The name Thomas Ewens appears again in the parish Poor Rate List of 1776 and from the Burial Register we know that this Thomas died in 1784. The next source we have is the first Land Tax Return of 1780 that included Susanna Ewens as proprietor and occupier at Town Mills, she was likely the wife of the Thomas Ewens who died in 1784. Her name appears in the subsequent seven years returns paying a fixed tax of £2 6s 10d annually. This Susanna Ewens was buried in Chudleigh Churchyard on 15 November 1787. We first meet with the Ewens surname in the Baptism Register of 1590 and probably those of the Ewens name subsequently recorded may well be the forebears of those at Town Mills. The next miller, again with reference to the Land Tax Returns in 1788 was Joseph Widdicombe, he continued until his early death on 20 July 1792 leaving his father in occupation at that time. Following his death the mill was advertised for sale in the Exeter Flying Post newspaper (16 August 1792). That article carried a very useful item as far as the early history of the complex is concerned. It firstly confirms that 'The Town Mills' are to be sold as 'Fee Simple' and that they had 'for many years' been in the possession of Mr Thomas Ewen. Significantly it goes on to describe the premises as 'the well-accustomed three water grist mills'. So from this we know our assumption of possibly two wheels at one time is now increased to three and that advertised then (1792) as grist mills the change from cloth fulling activities must have been at some point earlier. It also revealed that the premises comprised of a dwelling house, courtlage, cellar, stable, cowhouse, linhay, hay-lofts, an orchard, about half an acre and three herb gardens, all adjoining. The sale notice confirmed that all the buildings and mills were in perfect repair and that 'the mills never want any water' and that there was convenient room to add 'any other mill'. To follow forward with occupiers and owners we need to go back to the year 1769 at Kingsteignton when a miller by the name of John Wotton married an Elizabeth Luscombe. This couple had two daughters and a son before John's early death from Small Pox at age 26 in May 1774. Their son, also of the name John was baptised at Kingsteignton on 30 October 1772 and it was he, at 20 years of age that came to Town Mills following the sale of 1792. John Wotton's mother, Elizabeth had remarried at Kingsteignton in November 1775 to John Whiteway, also of that parish and it was he, we believe who initially purchased Town Mills in 1792. John and Elizabeth Whiteway had thirteen offspring in the period 1776–1793, all of whom were baptised in Kingsteignton. We know from their respective wills that they both remained in Kingsteignton and from the Register of Burials both were buried there. But it seems that John Whiteway certainly oversaw the operations at Town Mills that until 1802 had John Wotton in occupation. Referencing back to the Land Tax Returns the 1795 to 1802 schedules show John Wotton as occupier at the mill where he continued to pay the annual tax of £2 6s 10d. On departing Town Mills John Wotton moved to nearby Palace Mills at which he remained until the mid-1850s. His son continued after him there for a short while afterward. Others of the Wotton name were also connected with Parkway Mill for a number of years. As John Wotton moved away so John Whiteway jnr (John and Elizabeth Whiteway's eldest son) replaced him. Born in 1776 he was then aged 26. This John Whiteway jnr worked the mill with his father and their names both appear in the Great Fire (1807) compensation list as having suffered loss caused by that event. This is an interesting fact as up until now it was not considered that the fire had engulfed the whole length of Mill Lane and therefore not causing damage to the mill. Compared with other claimants their loss was small which might suggest the damage to the mill was not too severe, however recollections of Miss Sarah Whiteway (written in 1908) refers to 'old Mr Gibbs' of Mill Lane in 1858, then in his 60s recalling that he had seen the mill 'burning down' when he was about seven years old. John Whiteway snr. died four years after the fire and was buried at Kingsteignton. We know that from 1809 this John Whiteway was one of the two church wardens who continued to serve in each successive year until 1816. This John Whiteway was also mentioned in the Exeter Flying Post (5 September 1811) when it was reported that his 18 year old apprentice, John Pidgeon had eloped. The 1823 and 1830 town directories list John and William respectively as millers, but do not state their location but would have been at Town Mills. The Land Tax Returns show that John Whiteway jnr was listed until his death in 1826. Throughout that period the tax charge remained constant at £2 6s 10d. In 1827 'Whiteway Widow' as proprietor and occupier is shown, this being Susanna. In that year the tax charge increased to £2 15s 7d and remained fixed until the tax was abolished in 1831. The 1823 town directory refers to John senior, buried in the churchyard on 12 May 1826 aged fifty and the 1830 directory to his son John, born in 1809. William Whiteway (per 1823 and 1830 directories) is the elder John's oldest son, born in 1810. The 1833 Electoral Roll listed Walter Whiteway (born 1811) at the mill and Samuel Whiteway (born 1813), his brother, succeeding Walter by 1836. On the 1838 Tithe Apportionment the name Samuel Whiteway is shown as owner of Town Mills with John Whiteway the occupier. The land comprised 5 acres 1 rood and 1 pole. The 1838 Electoral Roll shows Samuel Whiteway to be of Ashburton and Chudleigh and holding the freehold of Town Mills. The 1841 census, the first available of the decennial census lists, at Town Mills, the first named as John Whiteway (30), miller, with him his wife Ann (30) and sons William (8) and John (6). Also listed was the younger brother of the first named John, Samuel Whiteway (25) as maltster. This named Samuel was left Town Mills in his father's will of 1826 but as he was then only 13 years of age the arrangement seems to have been that it was in a form of trust until his majority with his elder brother John running the mill as tenant along with his mother Susanna Whiteway who died in July 1836. We know that Samuel took over as master of the mill in 1845 and by 1851 his brother John, by then married and living in Fore Street, Chudleigh was in the census stated as farming 57 acres and working as a baker. Family records state he was left 'mills at Luton' (near Ideford) in his father's will and over the years tried various ventures, none of which were particularly successful. From other sources we know that this John Whiteway was made bankrupt on 31 October 1845 which explains why his brother Samuel took over at Town Mills. We also know that Samuel's brother John had, in the early 1840s, an interest in another mill at Chudleigh Bridge. That mill belonged to Lord Clifford and for a few years John Whiteway was his under-tenant. Falling out with the tenant (Thomas Sanders) when asked to vacate the premises in 1848 John Whiteway secretly removed the mill stones to a yard in Mill Lane. He was taken to court over that activity but was acquitted. On 8 May 1842 Samuel Whiteway married Sarah Meadway, their marriage lasted twenty years, she passing away in early 1862. She was likely a younger sister of John Meadway who was connected with land close to Parkway Mill, Chudleigh in 1838, he later moving to Kenn parish. Early in 1863 Samuel Whiteway re-married to a widow by the name of Amy Yolland. 'Superior Corn and Grist Mills To Let. The 1850 directory lists Samuel Whiteway as acorn miller, presumably at Town Mills. The 1851 census records Samuel Whiteway (37) as miller and maltster, wife Sarah (36), son John (7), Susanna (5) and Thomas (1). On Thursday 30 September 1858 a serious fire occurred at the attached mill house, as occupied by the Whiteway family. By reference to the Weekly Express newspaper we learn that the alarm was raised in the early hours by two passers by on their way home from Ideford. From Tower Hill they had noticed excessive smoke issuing from the mill house chimney. On arriving at the premises they aroused the Whiteway family who quickly made their escape. The parish fire engine was called and spent two and a half hours tackling the blaze. The article stated that the flames ascended to a great altitude and were visible for miles around. From the house the fire spread to the adjacent mill and had not the roof of the house collapsed when it did it was reported that damage to the mill would have been much greater. As it was the fire completely burned the belts and caused the joists to assume the appearance of cinder. The house was almost completely burned save for the external walls and almost all the family belongings lost. All livestock on the premises were saved as was all the wool but at least 100 bushels of wheat and thirty hogsheads of cider were wasted. The article concluded 'the appearance of the site now forms one of complete desolation, from the fact that only the bare walls of the dwelling-house are left standing'. The house was rebuilt – probably still under a roof of thatch – and two years later the wooden mill wheel was replaced by a much larger (20ft diameter) wheel, comprising a cast iron outer rim with twenty spokes of oak and seventy 'buckets' made from elm. This iron for this wheel was forged at Ideford by Ivor Hall, in those days a blacksmith of high repute. The speed of the wheel was controlled by the flow of water in the leat and could reach 30 revolutions per minute, developing between 15 and 30 horsepower. For detail of the leat itself go to the end of this article. The mill floor. The millstones are either Derby Peaks or French Buhr. The 1861 census has Samuel Whiteway (47) miller and maltster, wife Sarah (46) and son John (17) millers assistant. Samuel, having taken over the mill in 1845 handed over to his son John in 1869. Samuel then moved with his wife Amy and daughter Sarah to live at Elmore House in the Fore Street. Samuel Whiteway died there aged 72 in 1886 and was buried in the churchyard with his first wife. Amy died in 1894 and was buried with others of the Whiteway family at the cemetery. Daughter Sarah died at Elmore House in 1908. Just before, or at about this date her brother John, recently retired from the mill came to the house with his wife Grace. 1891 John Whiteway (47) miller and farmer, wife Grace (50) and son William Samuel (20) miller's assistant. We have recently been given a copy of an apprenticeship indenture under date 22 June 1896 where Mr Thomas Baker of Fore Street places his eldest son George Thomas Baker (then aged fifteen years) with John Whiteway – miller and corn merchant – for a period of three years where he was bound to 'honestly serve', 'his master's secrets keep' and 'lawful commands obey'. In return, John Whiteway was to provide 'good and sufficient food, drink, washing and lodging'. George Baker was to receive one shilling per week in the first year, rising to one shilling and sixpence in the second and two shillings and sixpence in the third year. It remained the responsibility of George's father to provide his son with 'fit and proper clothes and wearing apparel of all description' and 'to making and mending of same'. The 1901 Census describes George – then aged 20 – as a Miller Journeyman, so we can assume from this that he successfully completed his apprenticeship. 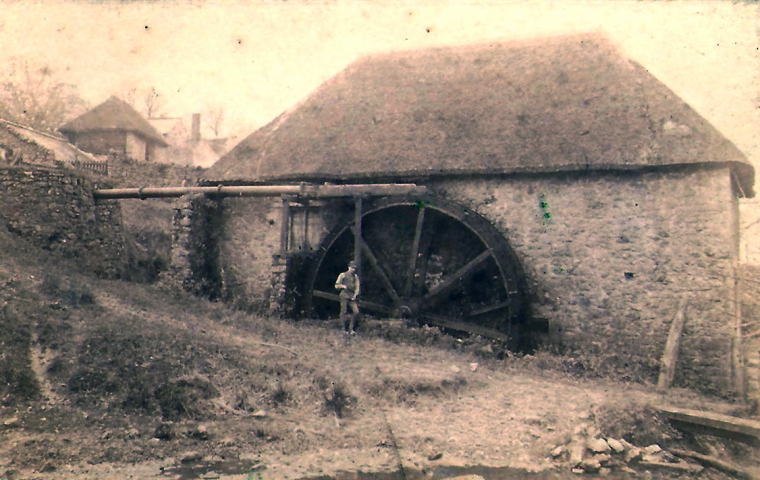 A postcard image of the mill and mill house dating to about 1905. The bearded gentleman standing in the lane is John Whiteway, at this time aged about 61 years. 1902/14 (town directories) – In these years the entries were the same as for 1893 but with the addition of insurance agents (fire, life and accident). In 1910 William Samuel Whiteway married Bessie Russell and together they had four children; Samuel (1911), John (1913), Grace (1917) and Annie (1919). 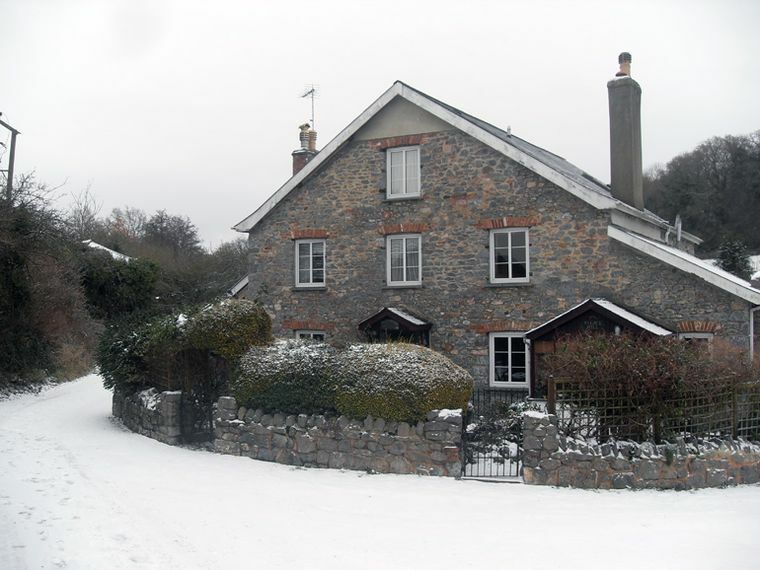 They lived at the mill house which by about their marriage date had been vacated by his father and mother, John and Grace Whiteway who had moved to Elmore House in Fore Street, a house connected with the Whiteway family since 1869. Detail of the logo on a grain sack from the early 1900s. The capacity of the sack would have been about two and a half hundred weight. In 1912 the Mid-Devon Advertiser carried the following announcement: '28 April 1912 – The death occurred yesterday of Mrs Grace Whiteway, aged 73 years. The wife of Mr John Whiteway formerly of Town Mills, one of our most respected inhabitants. The funeral will take place at the cemetery.' This is evidence that at that date John Whiteway had at some point earlier retired, leaving the Town Mills business in the hands of his son William. 1919/26 (town directories) – The entries now had changed to Whiteway & Son. Millers, corn, cake, manure and forage merchants, farmers and dairymen and insurance agents (fire, life and accident). The addition of "& Son" is unusual in that the business was only run by William Samuel Whiteway. In this period W.S. Whiteway and his family continued to reside at the mill house until 1923 when they moved out to a house by the name of 'Chelwood', located in The Parade. Both William and his father had played a very active part in the community, John Whiteway had acted as vicar's warden without a break from 1884 and his son as parish council chairman 1921–23 and committee member 1923–26. In 1923 William Whiteway turned 53 years of age. With a succesful business but not in the best of health he offered the mill premises and business on a short lease as his sons were only 13 years and 11 years respectively and obviously not of an age to follow their father in his business. The lease was taken on by 40 year old Francis Sudbury Hamlin. A miller in his own right who had most recently been in charge of two mills at Ashburton – Town Mills and Furzeleigh Mill. Originally of Tiverton, the son of a flour miller he had worked with his father for a period in Gloucestershire as a grain merchants clerk before returning again to Tiverton and thence to Ashburton by about 1922. In 1926 barely three years after Mr Hamlin's arrival in Chudleigh the deaths of both John Whiteway (aged 82) and his eldest son William (aged 56) occurred at 'Chelwood'. Ownership of the mill passed to William's widow Bessie Whiteway and as their sons Samuel and John were still only aged 15 and 13. Francis Hamlin continued the business as leaseholder. The 1930 Trade Directory confirmed his presence and described him as a miller. Vacating the mill house Francis Hamlin was followed by Stanley Cornish and family who then ran the Town Mills complex as a farm with Francis Hamlin continuing to use the mill itself for his feed and seed business. The South Devon Weekly Express newspaper carried regular advertisements from early 1932 for his business stating that he stocked all kinds of fertilisers, including special potato, superphosphates, general horticultural, basic slag, sulphate of amonia, nitrate of soda and fish manure. Being a farm site quantities of farmyard manure were also advertised. In addition Scotch Seed Potatoes were available along with poultry meals and food. Specialities being chick feeds and chick and layers mashes. Francis Hamlin continued to trade in his own name until joined by Samuel Whiteway (William Whiteway's eldest son) in March 1934. At that point they became directors of Hamlin & Whiteway Ltd and within a few months had also opened at larger premises in Teign Road, Newton Abbot. Quay Mills (now part of the Tuckers Maltings complex) was operated by them until the mid-1960s. An advertisement for them in early 1948 confirmed their business as millers, corn, seed, manure and forage merchants. Additionally seed potatoes, fertilizers and Devon Humus was available. Samuel's younger brother was not connected with the business and had moved away to live in Hampshire some years before. 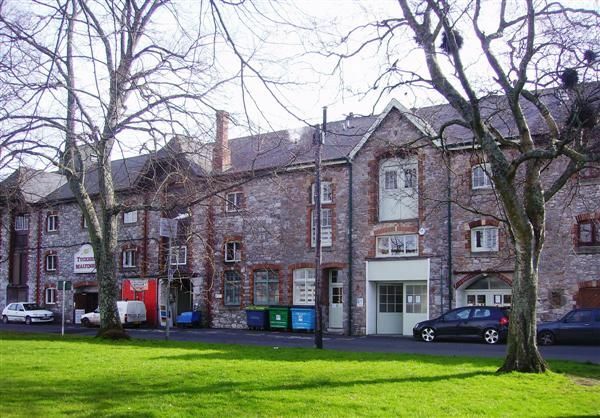 The former Hamlin & Whiteway premises, Quay Mills in Teign Road, Newton Abbot. The business operated from here until the late 1960s. In early 1935 a new Fire Brigade was formed in the town and their first call, on 4 March 1935 was to an incident at Town Mills. 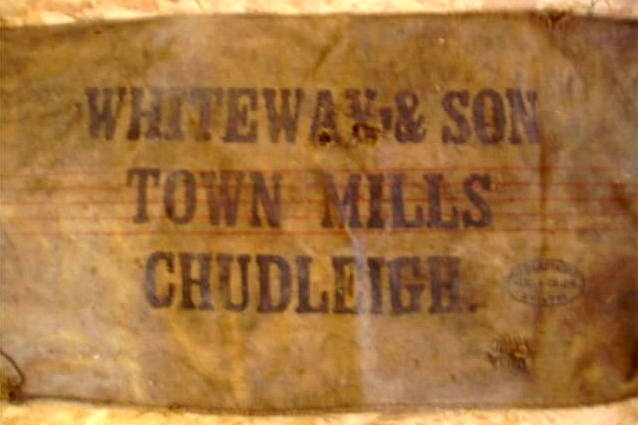 This later prompted Mr Samuel Whiteway on behalf of himself and Mr & Mrs Stanley Charles Cornish (the leasehold occupiers of the adjoining Town Mills Farm) to thank the council for 'all the help given and especially for the very prompt action of the Fire Brigade in dealing with the outbreak'. Unusually perhaps, a report of the fire did not feature in the local press. The year 1939 marked Mrs Bessie Whiteway's death and the ownership of the mill complex passed to her son Samuel Whiteway. Corn milling had also ceased about the same time and not long after the outbreak of war the Ministry of Food requisitioned the mill buildings for the duration of the war and for some of the time it was used as a sugar store. It was from here that the schoolchildren would receive their daily milk, poured straight from churns. The milk was provided by Mr Cornish who ran a dairy in addition to his farming activities. He also provided a milk delivery service to the town via pony and trap. On Thursday 9 January 1941 the adjacent millhouse (then in use as the farmhouse) suffered a severe fire which caused the Cornish family to be made homeless. The fire spread across to the four-storey mill building, then still in the ownership of Hamlin & Whiteway, charring the upper floor and destroying the roof. Breaking out at three a.m. the Chudleigh Brigade was assisted firstly by the Newton Rural Fire Brigade from Bovey and just within the first hour by the Newton Urban Fire Brigade. By the time the Newton engine had arrived the house – according to the South Devon Weekly Express – was a blazing inferno rendering it impossible to save along with the majority of the furniture belonging to the Cornish family. An abundance of water from both the mill leat and the Kate Brook ensured that the mill and various of its outbuildings were saved. Several cows, horses, pony, pigs and implements as well as a large motor lorry belonging to Messrs Hamlin & Whiteway were also saved. A local Chudleigh resident, then aged eight can recall watching the fire brigade in action and remembers that it was so cold that the water froze as it ran down Clifford Street. Comparing the 1905 (above) and 1965 (below) photographs of the millhouse it would seem that the external walls of the house at least were not reduced to ruin as might be suggested by the newspaper article, unless the house was very carefully rebuilt in its former style which seems unlikely. After the war the premises remained in the ownership of Samuel Whiteway until Cristmas Eve 1948 when on that day ownership of the buildings and land passed to his tenant Stanley Cornish, ending a six-generation Whiteway family connection going back 155 years. Stan Cornish continued his occupation of the former mill house until 1950 at which point accommodation, often referred to as a 'bungalow' was created out of a two-storey farm building to the rear of the mill. The family then moved to the upper floor of that dwelling with the ground floor in use as the dairy. The mill house was then let to a succession of tenants. Stan's eldest son Charles was married in 1954 and to create a first home for him and his wife the mill building was divided in half with the western half becoming their home. This house was named Higher Mill House and remains so called today. Since the war the mill had only been used for storage so to lose half of the space had no adverse effects. Looking up Clifford Street toward the mill complex in October 1964. The ladies on the left were members of the Whiteway family and at this time on a visit to Chudleigh from Canada. Paticularly note the enclosed winch housing attached to the dormer. Stan continued to run the farm until his retirement in 1966. He and his wife then left to be followed by his younger son Stanley who with his wife continued the farm business until 1970 when they moved to Marldon near Paignton, Devon. An aerial view of Town Mills Farm of about 1966. Note the mill leat coming in from top left and exiting into the Kate Brook, near bottom right. The newly-built Millway houses are opposite the mill and the cul-de-sac Kits Close (built 1963) over to the left. In 1971 Mr Terence Hart moved to Chudleigh from Essex and acquired the then empty Town Mills complex. He took up residence in the mill house and not long afterward made the acquaintance of Mr Robin Sturdy. In conversation Mr Hart said that his idea was to convert Town Mills into a craft centre and it was not long before that idea came to fruition. Together they formed a company – Town Mills Craft Centre Ltd – and in 1972 the restoration programme commenced. 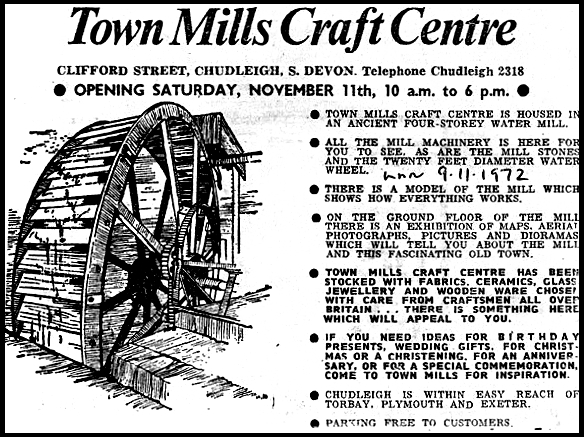 After a great deal of renovation the premises opened to the public on 11 November 1972 as 'Town Mills Craft Centre'. With a cafe, gallery, wholefood shop and seventeen craft businesses on site, the free attraction was popular with local people and tourists alike. A weaver, spinner and glassblower were also on hand to provide demonstrations. 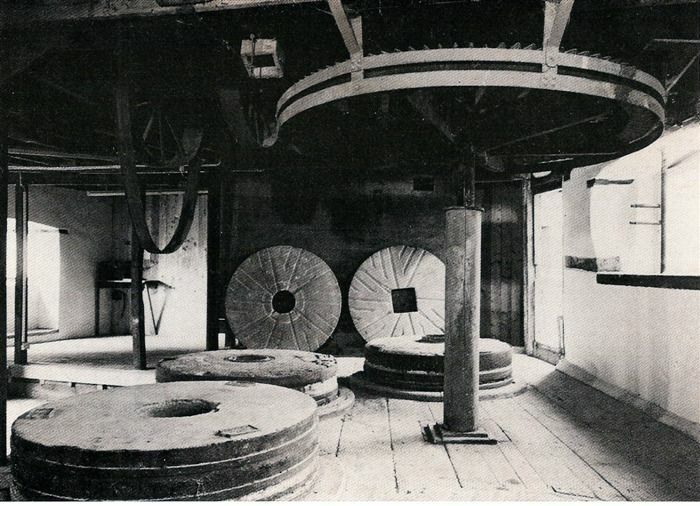 The original plan was also to restore the twenty-foot water wheel to working condition and on 8 May 1973 following six months work a ceremony was performed by Lord Clifford and watched by members of the Amenity Society, Chudleigh Parish Council and invited guests. Local craftspeople were based at the centre, now with the added title of 'The Wheel' as were amateur artists who had the space to exhibit and sell their work. Caithness Glass and Nottinghamshire Lace were also available alongside traditional local crafts. The business was a success and also became the birthpace of 'The House of Marbles' but by 1977 Mr Hart was ready for a new challenge, he subsequently moved to the Highland town of Dornoch where he acquired the old jail and turned that into a craft centre which still continues today. His business partner, Mr Sturdy went on to acquire the old pottery works in Bovey Tracey at which 'The House of Marbles' business was re-established and also continues today (under its official name Town Mills Craft Centre Ltd) as a well-known and popular attraction. 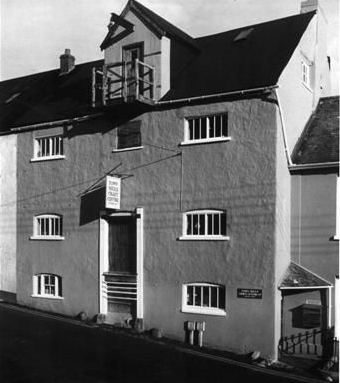 Towards the end of 1977 the craft centre and all its buildings were acquired by a Newton Abbot double-glazing company. 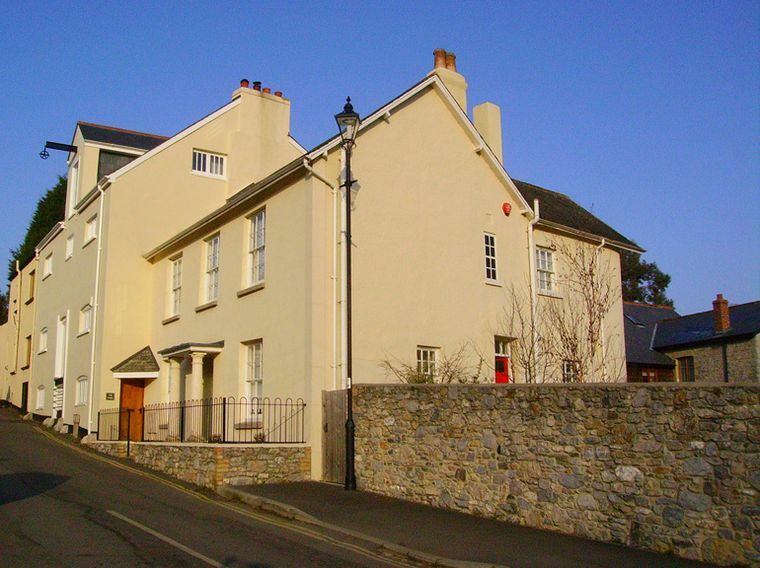 The director of Launa Windows, Mr Richard Freestone was already in Chudleigh having been involved with the restoration of the old Baptist chapel in Exeter Road. Eighteen months later, at Easter 1979, the new craft centre opened its doors to visitors and it was estimated in that first weekend of opening no less than 2,000 people passed through the gate. Twenty new jobs had been created and along with viewing the waterwheel, visitors could partake in refreshments and cream teas and especially for the children there was an animal corner with a ginger pig and a tame fox among its residents. Mr Freestone initially lived in the mill house but after a short period the ground floor became the location of the new restaurant and the upper floor let out. By 1985 ownership of the complex had passed to a Mr and Mrs Hewitt who by the December of that year had leased out the craft centre to a co-operative comprising the resident businesses and retaining control of the restaurant themselves. 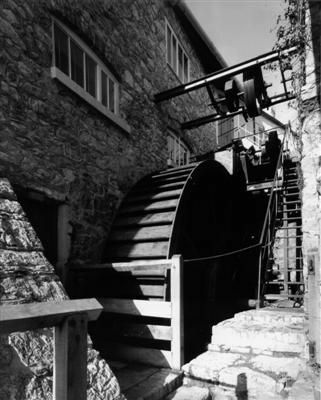 The waterwheel broke down in the summer of 1987 and the centre faced a £20,000 bill to repair the wheel which had developed a 'wobble'. The nineteen resident businesses launched an appeal so that restoration work could proceed. The original owners, Launa Windows put up £4,000 and a further £8,000 was promised in grants from Devon County Council, Teignbridge Council and the Council for Small Industries in Rural Areas. The required sum of £16,000 was reached and a Bristol firm, Dorothea Restorations had completed the necessary works by the July of 1988. 'Water Mill converted to craft centre. Circa mid C19, on the site of an earlier mill complex, renovations of 1972. Local grey limestone rubble, colourwashed and gabled at ends ; right end stack. Rectangular plan. 3-storey mill building with a large backshot water wheel at the rear in working order. 3-bay symmetrical front to the road, the 3 storeys crowned by a gabled wooden hoist housing with a gabled doorway in the roof and a projecting wooden platform with timber rails, most of the timber appears to have been renewed. First floor doorway in centre with weatherboarding below. Ground and first floor windows have segmental heads and vertical glazing bars, the second floor windows have vertical glazing bars, the centre window with a timber lintel. The rear elevation is unrendered with brick arches to the first floor windows. Impressive backshot wheel, 20ft in diameter, was installed in 1860 with a cast iron outer rim forged at Ideford by a local blacksmith, Ivor Hall. The wheel has 20 oak spokes and 70 elm buckets. Interior Considerable survival of machinery in working order, including gearing, a late Victorian iron roller crusher and 2 winches. Stair altered during conversion to craft centre, roof trusses replaced after a fire of 1941 but the old charred trusses survive. The mill was last used for corn grinding in 1939. The wheel is said to be the largest working backshot wheel in the south of England. From the Craft Centre Guide of 1985, showing a cross-section of the mill floors. Successful years followed but by the mid-1990s the decision was made that the centre was no longer viable and was closed down. Local house-builder Cavanna Group came to Chudleigh in 1999 and acquired a large area of land lying to the north east of the town roughly bounded by Fore Street (west), Cricket Field (north), Kate Brook (east) and Town Mills (south). As part of what was to become their Millstream Meadow development a through road was to be constructed from Littlehill on the Exeter Road to Lawn Drive but the obstacle was the Town Mills complex. 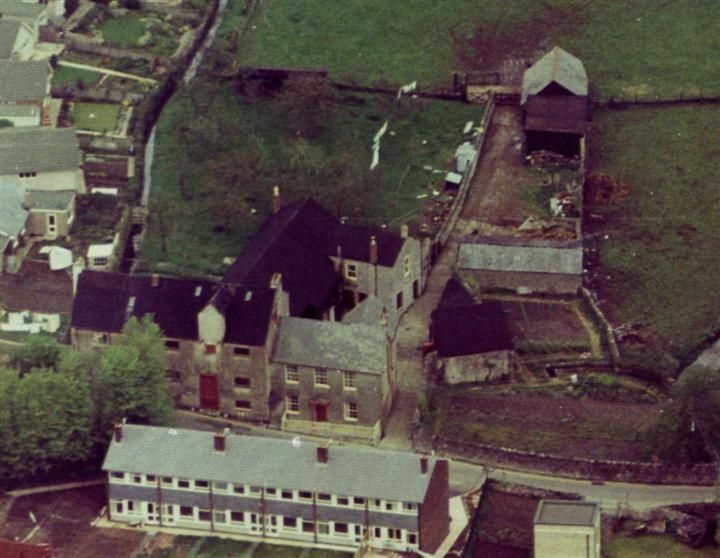 Although then vacant Cavanna were not able to secure what was required to build the road and so they purchased the whole mill complex in 2000. However, as a house-builder they were not concerned with property renovation so the redundant buildings were boarded up and left alone. Some two years passed until local builder Mr C Cox purchased all of the buildings and embarked on a major renovation and restoration project. 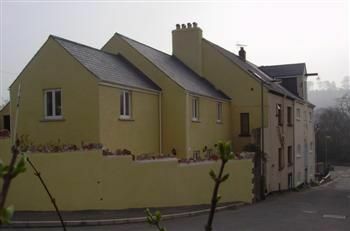 Some four years later – October 2006 – all the properties had been converted as dwellings and were ready for sale. In addition to those already existing, two new-build detached properties were built behind the mill complex and named Upper and Lower Mill Cottage respectively. Unusually for new houses these were constructed with roofs of thatch. In total the mill complex comprises 'The Wheel' (the original mill building), The Mill House, Town Mills Farm, Mill Bungalow, Lower Mill Cottage and the two thatched houses already mentioned. Cavanna Group went on to complete the road link as planned which passes through part of the original farm yard and from which – through double wrought-iron gates – is the access to the Town Mills Farmhouse and Mill Bungalow properties. The Mill House photographed in 2009 with the four-storey mill building beyond, now called 'The Wheel'. Looking down Clifford Street in early 2011. The mill leat, generally 3ft wide by 2ft deep runs for about one mile, in a north/south direction starting at a point near Hams Barton farm. Passing between the cricket field and the old Baptist chapel it is joined by the Buddle (or Bottle) Brook for a short distance. At a weir close to the start of the Millstream Meadow development the brook diverts east to join the Kate Brook at Kate Bridge. The leat continues to flow on an almost straight course passing through the Millstream development. Originally the plan was to create a public footpath alongside it but this ultimately did not happen. As the leat passes each garden boundary the occupier of those properties have responsibility for that part that forms their boundary. In the early 1800s the leat was improved by Napoleonic prisoners of war and some of the cobblestones laid by them are still exisiting in the leat bed close to the mill. In the 1971 restorations a French Cent coin dated 1792 was found in the silt when clearing the channel. At the rear of Higher Mill House the leat turns sharply left to reach the launder and so directed out onto the waterwheel. From there it passes under the courtyard through a stone-arched channel and then under the Millstream Meadow road to flow into the Kate Brook just before Bridgelands Bridge. Footnote: The History Group has received valuable assistance from Mr John Whiteway of Winnipeg, Canada in the compilation and checking of the Whiteway family history part of this article. Particular mention should also be made of his provision of the 1905 postcard view and October 1964 photograph used in this article. Very little is known of the history of Waddon Mill other than it seems solely to have provided for the Waddon Estate. The mill building still exists, – standing close to the Waddon water-splash – but is in use now only as a lumber store. The solidly built structure is today tin-roofed, but was originally thatched (as it still was in the 1900 picture below). It is the north wall (the left side viewed from the lane) that had the overshot water wheel and some evidence of it still remains, though that side is now densly overgown. Various cog wheels can be seen but any wooden element to the wheel has long rotted away. On its south side can be seen another doorway and the roof here leans out, providing a form of shelter when carts were alongside being loaded or unloaded. The period of operation of the mill is not known, reference to the 1851 census contains a number of labourers residing at Waddon but no one is listed as a miller.